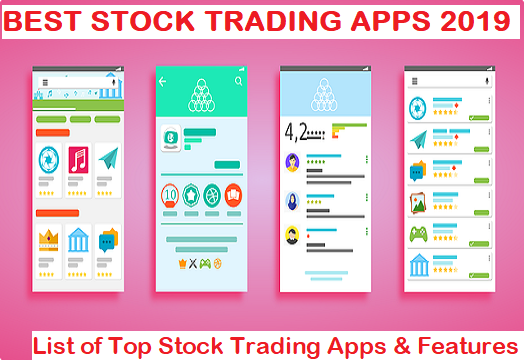 Best Share Trading Apps in India for 2019:- Online Mobile Trading Android Apps? Our today’s matter of contention is on which APP is best for share market trading in India. Stay tuned for this article to know which the best App for online share trading. It’s always been an easy approach to use a mobile app rather than the websites or the manual platform. The app provides you with every facility and quick access to every information just with some clicks of your fingertips on your mobile screen. Are you wondering how to invest in the share market, then here’s the rescue mobile app for online share trading & intraday share trading is prevailing and are loved most these days by the people. It does not have to ease their accessing capacity but it also has reduced the time consumption. In this article, we will talk about some online share trading app which is standing at the top 10 positions as per the reviews and ratings of the users. Below, I have listed the best mobile app for trading in India. Let’s explore in details the specification about the best mobile share trading Apps in India. Best ways to Earn Money from Share Market? 5 paisa is a discount broker app which offers round the solution services when it comes to performance, a speed of order execution and user experience. It is one of the most reliable best stock trading app for Android which offers great security to its investors. You can easily buy and sell your units at the touch of your fingertips on your mobile phone. The order execution is so fast that it enables the user to execute the intraday transactions to take place at the speed of the highest. The funds can be transferred within minutes and handled very properly. This Free share trading app allows you to trade in Equity, Stock, Index, currency and Futures and that too at the lowest cost. As soon as you enter this app, it opens and manages your 3-in one account, i.e. your Demat account, Trading account, and the savings account. It also offers free charge services to open the investor’s account of those who are new in the field or who are seasoned investors. The Auto Investor tool of 5Paisa knows the objectives of the investors, risk profile, their income, and expenses and based on this knowledge, this tool forms a portfolio that suits the best to the investor. The Fund Finder tool enables the active investors to filter the best funds for them on their own criteria and then start a SIP or lump sum mechanism. It offers real-time services like it avails streaming quotes from NSE and BSE, updated information regarding equities, derivatives, currencies, Futures & Options etc. To make the trading experience even more amazing, it offers charting features and broadcasting features. You can invest in mutual funds also through this app. The web portal product of Zerodha is also available in Mobile version also. It has a strong user-interface and it has a very high interactive design to provide a good interface for the users. It is counted among the top discount brokers as it has a large number of customers as compared to its competitors. For all investments, zero brokerage is charged and for trading, Rs20 is charged for every order. The order can be Regular, AMO, Bracket Orders and cover orders. It researches around stock exchanges –NSE, BSE, MCX. It deals in equities, commodities, Future and Options, and currencies. This Mobile trading app allows you to trade in Equity, Stock, Index, currency and Futures and that too at the lowest cost. It also presents the historical data of your shares or market performance. It can be monthly wise or long year’s base. The IIFL mobile app was launched by the India Infoline services. With just a single click and swipe and confirm feature, the order quickly takes place and this quality makes it unique in itself. The app has been designed within the size as 38.2MB. The clients can easily apply for IPOs and OFS. There is a guest login feature also for the users who want to understand the basic features of the mobile app. The stock watch feature allows the user to keep user’s selected stocks right in front of the home screen.it has multiple stock watch list. The Kotak Stock Trader is a popular app launched by the Kotak industries. It mainly trades in equity, derivatives, Futures & Options and currencies. You can place your order anytime and even cancel the same without any problem. It tracks your portfolio performance and also checks the available balance in your account. You can also track the market rates or economy performance by refereeing the Nifty and the Sensex. The feature in the app “My Investment” lets you know the number of investments made by you until the day. The size it is covering in the mobile is 54 MB. Thanks for Reading! stay tuned for another post, till then, bye, bye. It is one among the leading discount brokers in India and after web-based portal, it is landed in mobile version also. It has different chart types which is customized i.e. the user can set the legends, colors etc. according to his choice. You can access to past 10 years data also and can easily do an analysis on them. Alerts and notifications are also pushed at the user’s mobile screen as per the choice set by the user. This app is launched by ICICI Direct. Streamlining quotes on the latest market updates are visible at the screen. Helps to keep a track on your portfolio and also the market movements. It trades in equities, commodities, derivatives, currencies and future & options. You can track your shares updos anytime from anywhere. You can collect any kind of research report from the app. It also works better in slow speed networks by availing the lite app functionality. It is a very common name known to the share market brokers. It is offering very speedy online services to trade the shares within seconds. The survey results and the market performance of the shares are all described by the way of good-intractable charts. You can even customize the legends choice also as per your requirements. The charts are presented to you on daily basis, on everyday market update-wise. Sharekhan is listed under NSE and BSE and provides a trading platform to buy and sell the shares. There have some graphical studies also for the market and they can be average, Band-Bollinger, KnowSureThing, MACD, etc. It also provides to with extra features like OAlert, Chart-book, Heat-map, trade from charts, and many more. The angel broking is an app which can be installed in iPhones and Android ones also. It provides trading of stocks platform which can be traded after doing ideal analysis on important facts. The factors which affect the trading decision are also availed by this app through some inbuilt tools. You can track the market movement on a real-time basis. The app is designed to trade in equity, derivatives, currencies, futures, and options etc. You can track your holdings and check the market news latest updated on the screen. You can view trade reports whenever you need it. You can transfer your funds and securities from anywhere and anytime. You will just need a mobile in your hand. Just a single click will let you know the statements regarding your contract, your account ledgers and Profit and loss account. Equities, derivatives, currencies, commodities, futures & options, Mutual funds, IPOs and what not. The Motilal Oswal mobile app delivers you all these products to trade through the app interface. It also provides real-time portfolio monitoring tools to help to make investment decisions on the move. It also provides a secured operation mechanism all throughout the process. The clients are given credentials using which he passes the authentication round while log-in. It also offers advanced features like attractive charts with 12 different indicators. You can also transfer funds via 40 connected banks to it. The TradePlus app is a brand of Trade Plus Company which was opened in 1983 in at Chennai location. It offers brokerage plans every month in all over India. You can trade your shares through this app which can be download in your android phones. You can easily be logged in using your credentials which automatically will link you with the three accounts, I.e., the Demat account, trading account, and the savings account. You can track your account and your depository participant account also with haircut valuations. Funds can be transferred easily via payment gateways of multiple kinds. Dear readers warm credit for reading the above content on Best Mobile share trading APP in India. If you like it please take the privilege of sharing with others. All the above stock brokers app have good reviews and good response in the market. They all time compete in the market with each other and updates their features for more enhancement in its working operations. So, whatever you will choose, you will experience a great experience over there. Oh yes! If you love this article then please subscribe us. And of course, for sharing your doubts and suggestions with us, you can comment inside the comment box and simply proceed with the comment button. Do not forget to hit the like button.